Marvel Phase 3 Videos Reveal Cast, Concept Art and More! Marvel Phase 3 Videos: See the Stars Meet, New Concept Art and Lots More! 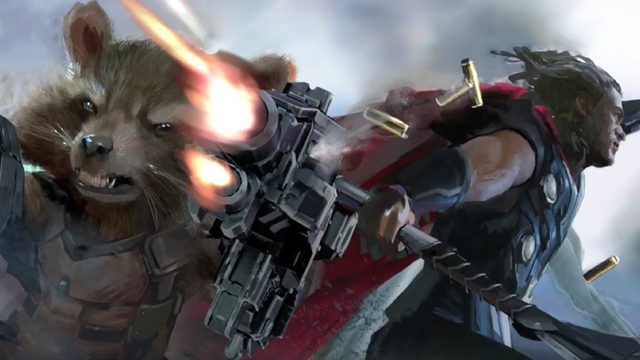 Check out two videos that tease what’s to come in Marvel Phase 3! Continuing a cinematic universe that launched in 2008 with Iron Man, Infinity War promises an epic story that will bring in characters from a decade of films. The cast includes — but is not limited to — Robert Downey Jr., Chris Evans, Chris Hemsworth, Elizabeth Olsen, Sebastian Stan, Scarlett Johansson, Chris Pratt, Zoe Saldana, Benedict Cumberbatch, Pom Klementieff, Tom Holland, Peter Dinklage and, as Thanos, Josh Brolin. Directors Anthony and Joe Russo, who return after Captain America: The Winter Soldier and Captain America: Civil War, are directing both Avengers: Infinity War and the second half, the mystery Marvel Phase 3 closer. Before Infinity War begins, however, we’ve still got quite a few exciting entries in Marvel Phase 3. On May 5, it’s back to the Marvel cosmos for Guardians of the Galaxy, Vol. 2. On July 7, the story of Civil War‘s Peter Parker continues in Spider-Man: Homecoming. Then, Marvel 2017 closes out with November 3rd’s Thor: Ragnarok, set to team up Thor with the Incredible Hulk! in 2018, it’s off to Wakanda on February 16 for Black Panther. Then Infinity War hits on May 4th. Between Infinity War and its follow-up, fans get Ant-Man and the Wasp on July 6, 2018 and Captain Marvel, starring Brie Larson, on March 8, 2019. Then Marvel Phase 3 concludes with the untitled Infinity War follow-up on May 3, 2019. What are you most excited to see in Marvel Phase 3? Let us know in the comments below!